These postcards from Abraham Lincoln, written to his friend Joshua Speed's mother, Lucy Speed, at Farmington Plantation in Louisville, Kentucky, are just pretend. But despite the fact that this fun and educational book may not contain true artifacts, Postcards from Abe provides an honest recollection of Lincoln's childhood, challenges, and career, culminating in his being elected to serve as the 16th president of the United States of America. 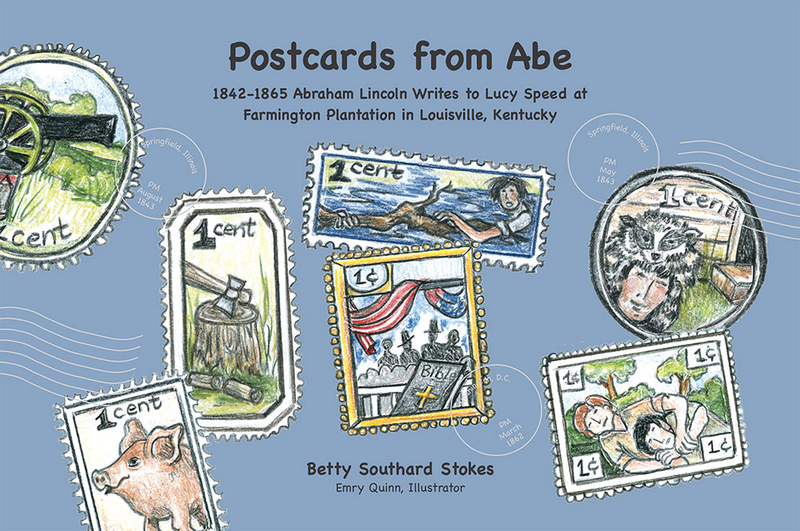 This collection, which is the fourth in a series of historical postcard books created by award-winning Kentucky educator Betty Southard Stokes, is a perfect way to teach history to children in a fun, imaginative way. 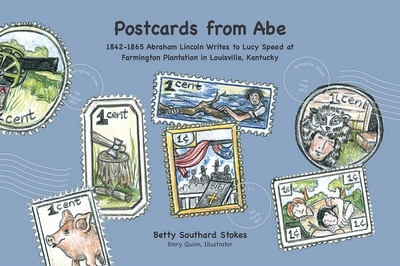 "Postcards from Abe makes Abraham Lincoln accessible to young learners. Historically accurate, the postcards humanize Lincoln as a child himself and as a young person facing the challenges of life — just like other children of his age, and of all ages. These postcards from Lincoln to his friend's mother, Lucy Speed, chronicle the story of Lincoln's life, from his Kentucky roots to his life growing up in Indiana, to his move to Illinois, and to his move again to Washington and national prominence. Pulling no punches on the "hard" issues of Lincoln's life, from the death of his mother to his struggle for self-education, to his mature struggles with civil war and the problem of slavery, Betty Southard Stokes's writing carries the human story along, while Emry Quinn's illustrations support and enrich the text. Postcards from Abe is a much-welcomed addition to the young adult literature on Abraham Lincoln." Born in Kentucky, Betty Southard Stokes is a longtime educator with more than 36 years of experience in public and private schools as a teacher and administrator. Betty's interest in Kentucky history inspired her work as an author of children's literature. Her current books are Postcards from William, 1803�1806: William Clark writes home from the Lewis and Clark Expedition; Postcards from George, 1763�1781: George Rogers Clark writes to Virginia from the Kentucky Wilderness; and Postcards from Daniel, 1755�1784: Daniel Boone writes from the Kentucky Wilderness. Betty's efforts have been recognized by the Council of Social Studies Teachers in 1985, KET's Education Notebook in 1987, the Kentucky Environmental Education Association in 1988, the National Education Association in 1989, KET's Inside Kentucky in 2002, Leadership Louisville, and the Kentucky Historical Society in 2010. She was honored as a Kentucky Colonel in 2014. You are invited to visit Betty's website at http://the-one-room-schoolhouse.blogspot.com. Emry Quinn is a mother of three and grandmother of one. Born in Kentucky, Emry has drawn and painted all her life. For more than 40 years, she used her creative skills in the floral industry, as a book and greeting card illustrator, and at a local day care. All her spare time is devoted to creating in various forms. Emry loves to draw, paint, laugh, and visit a spell.